The Skulleye stainless steel skinning knife is designed with function in mind. 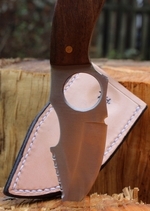 It is small, sharp and has all the tools you need to skin and gut your quarry. With a large finger hole and deep thumb recess your cuts will be precise and definite. Available with both American Oak and American White Oak scales.